Company websites are now an essential part of doing business and being successful. Websites give access to all types of information about a company as well and serve as a form of advertisement. Despite the great benefits, there are also many costs involved in a truly professional site. A smart company uses a website budget tool to weigh the potential costs and benefits and uses this customizable tool to get the most benefit out of a website. Customization of the form allows a company to tailor the benefits and costs to suit categories actually used and allow for accurate calculations. Properly planning a website before executing the project ensures that a company is prepared and successful in its future. Using the free, customizable website budget tool is very easy. First, download the template from this page and open into Microsoft Excel. Enter the company name and date at the top. Next, change all of the sample numbers in the white cells to reflect actual estimates for the company website. Pay careful attention and do not change any information in the grey cells; these will be automatically calculated. The brown cells do not need to be filled out. Once all the numbers are entered, save the file. The budget tool will now show projected net present value (NPV), internal rate of return (IRR), and payback period. These projections are vital to understanding how a website will help a company become more well-known and profitable. First, use the tool to look at the future costs and profits of the website. The website budget tool allows a quick look at a 3-year period and suggests the payback period. A savvy company will use this to plan realistic future goals. 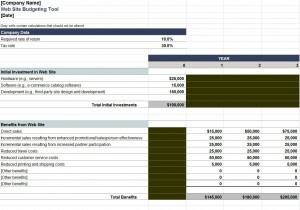 Second, use the “other costs” and “other benefits” rows to fully customize the website budget tool. Change the names of the rows to describe the added information. Also think about renaming existing descriptions if they don’t reflect the company’s needs accurately. Third, be sure to save the file in a safe place, or in multiple places. The projection will be useful again after the website is launched to compare real numbers to the projected ones. The comparison is valuable for understanding several things, such as when the actual payback period ends and how well the company plans.